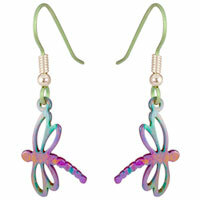 Ti2 hypoallergenic titanium dragonfly drop earrings on titanium hooks. 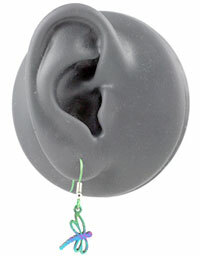 Please note: The ball and spring on the earring hooks are made from solid silver. This does not touch the skin so should not cause a reaction if you are allergic to silver. However if you are concerned about it you can just slide them off the hooks. My daughter has had nothing but problems with her ears since having them pierced. I have bought the studs from here and they gave been perfect for her. She wanted dangles for her birthday so I came back to serenity once again. Although not worn yet I have no doubt they too will be the usual standard. This item was for a Christmas present and that nothing but praise from the person who receive them. So thanks for everything and that will buy again. Bought these for my ten year old granddaughter and she loves them. So far she has not had a flare up of an alergic reaction that she gets with other type of metal earrings. 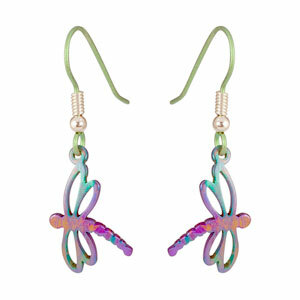 These are really pretty and light weight earrings that are just that little bit different.